3M Dusted Crystal is a versatile vinyl window film that can be used indoors and out. It can go on as a basic frost, be custom cut as it is here, or it can be printed on. 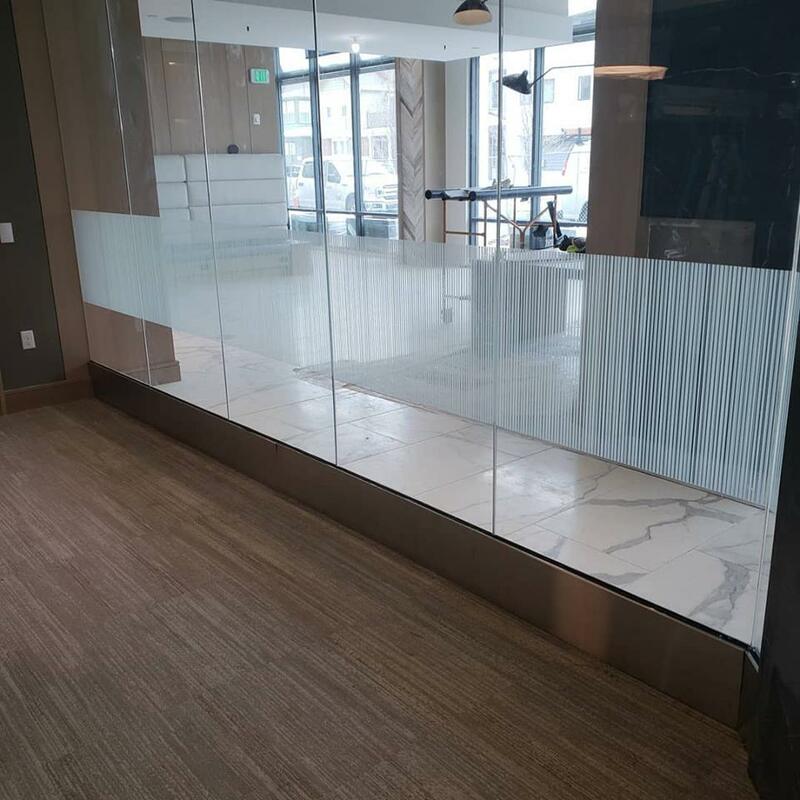 If you’re looking for a creative solution for your office glass, window film is the answer. 3M Arpa Window Film is a great way for your office to obtain a chic look and feel. 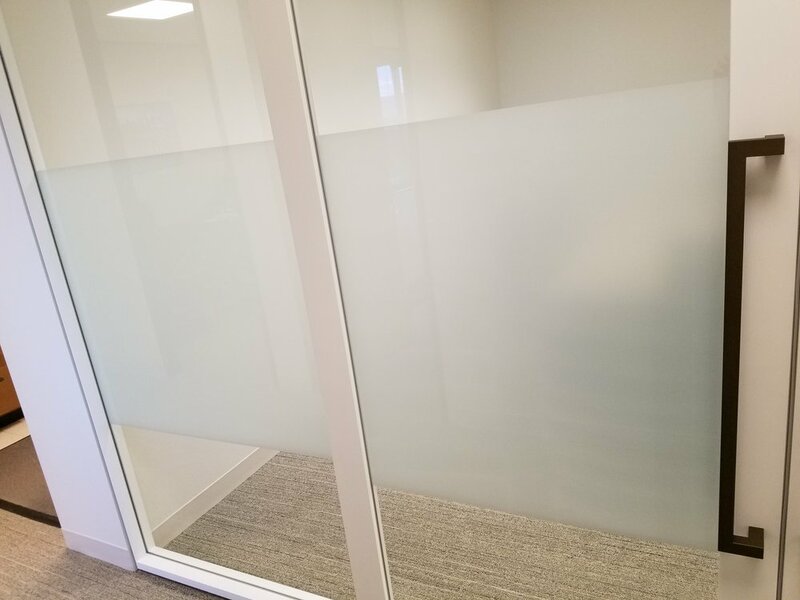 The vertical line feature of 3M Arpa Decorative Film adds the illusion of more height to a simple meeting room, while the frosted white color of the vertical lines enhance light, and add a unique design scheme to otherwise basic office glass. Visit our decorative films page to view all of 3M’s Fasara Decorative Window Films. 3M FASARA “ARPA” Professionally installed by Solar Vision Inc.
Definitely! The winter can be some of the most intense sunshine of the entire year. Especially for those south facing windows. Some homes with large picture windows can even become uncomfortably hot in the winter. Along with heat, the winter glare can be incredibly intense. Plus, UV rays don’t care about the temperature outside. They’ll cause just as bad, if not worse damage and fading to your homes furnishings and window coverings in the winter, as they do in the summer. Depending on your situation you have many window film choices. If heat and glare are your main issue, then a traditional window film will work great. However if you’re also looking to retain the heat in your home while blocking the heat during those intense part of the days an insulating film might be what you need. An insulating window film like 3M Thinsulate will make your home more efficient 24 hours a day, 365 days a year. Solar Control Window Film is a necessary upgrade for any home, any time of the year, and there is no better time than the winter time to make your home more comfortable year round. 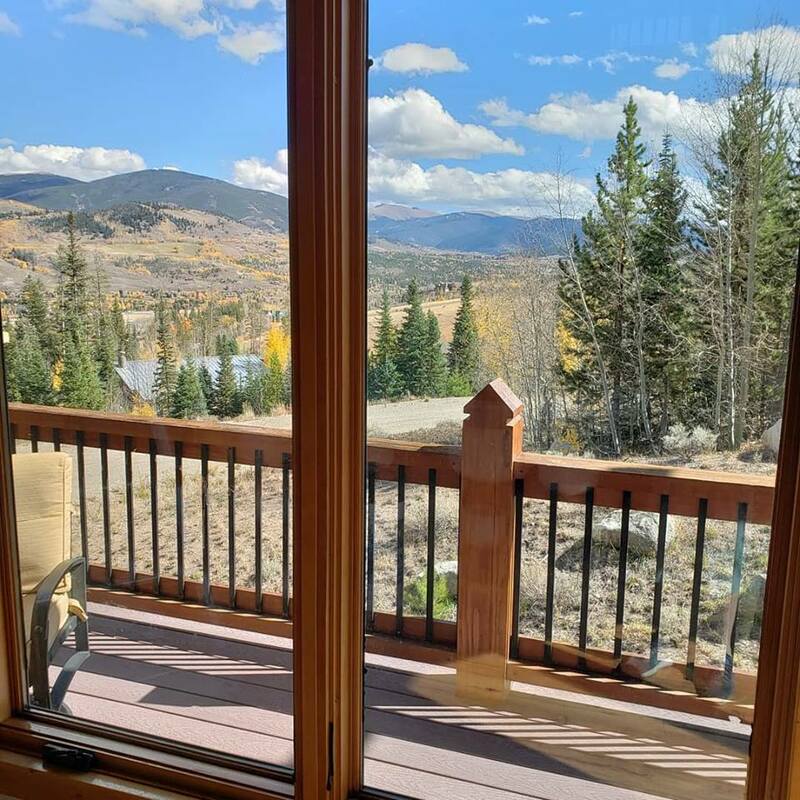 3M Prestige Window Film application in Vail, CO.
3M Prestige 70 window film is the perfect solution for heat and UV reduction. You can hardly tell it’s even there, but you can feel it! If you’re looking to protect your home, or building without changing the appearance, 3M Prestige 70 might be just what you are looking for. The window on the right has 3M Prestige 70 applied to it, the window on the left doesn’t. Tagged: 3M Prestige Window Film, 3m solar control film, window film, window tint, Solar Vision Inc. 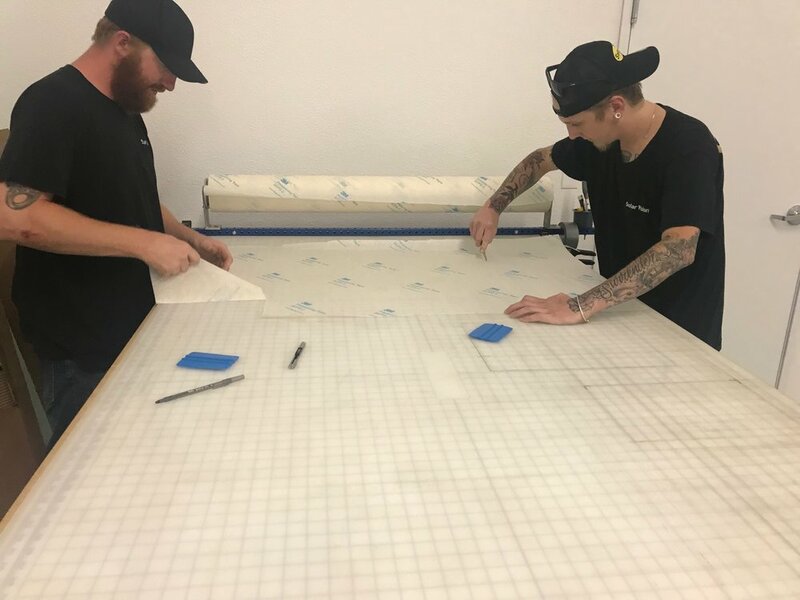 When Heath and I started this small window film business out of our garage in 2004, we had no idea it would grow to be what it is today. Originally Heath would do the installs, and I would invoice and process warranties. 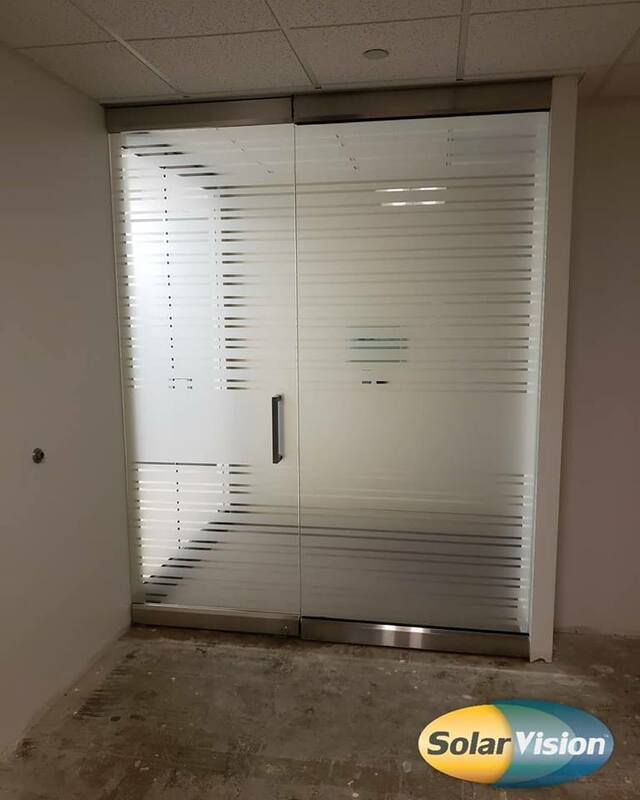 In the beginning we were mostly a sub-contracting window film company that other local window film companies would hire to do their installs. It worked out pretty well for a few years, and we were able to grow and bring on more installation help. 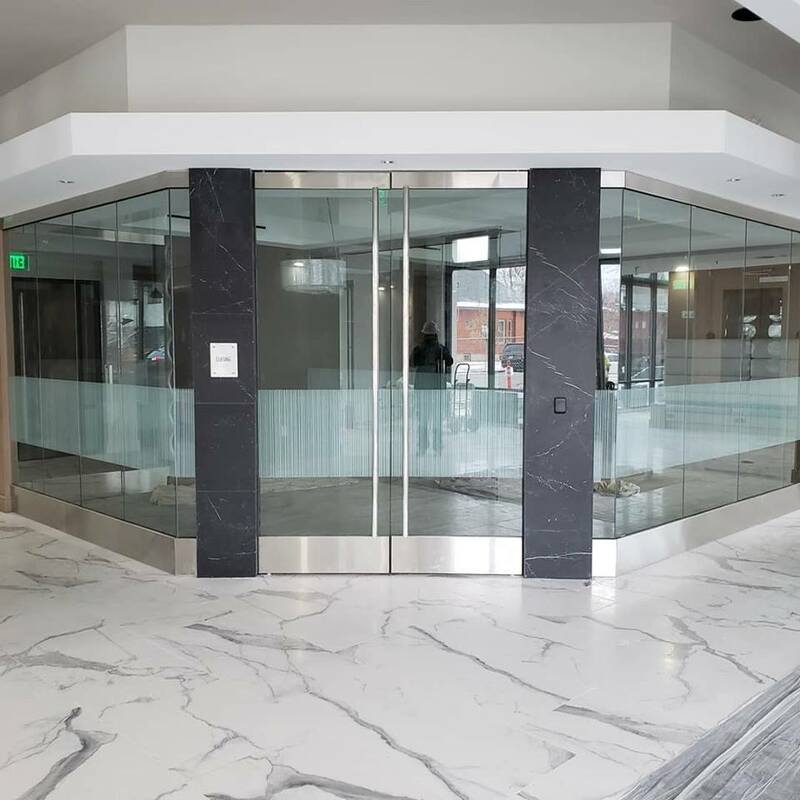 However as the jobs got harder, and more demanding, we couldn't help but notice a genuine need for a legitimate window film company in Colorado's ever increasing construction market. 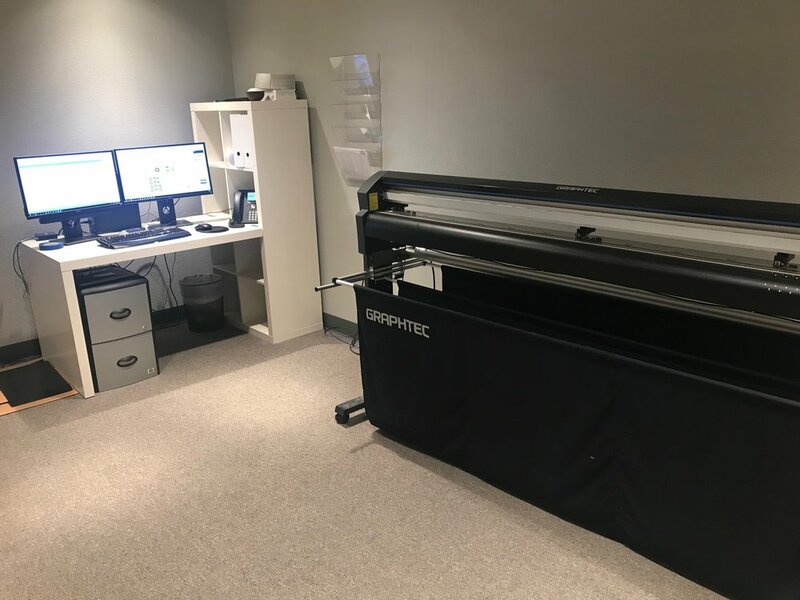 After hiring more Window Film Installers, and a Residential Sales Manager it was time to expand out of the home office and garage to our first commercial space. With all the new growth we needed more help, and that's when we brought on an Office Coordinator. From there the growth continued by bringing on more full time installers, a Graphic Artist, and Estimator. Solar Vision Inc. is now a team of 14 people working out of a new 6000 square foot shop, and warehouse space! Teamwork. It tends to be a dismissed term, due to overuse and cheesy break room posters. While almost everyone can agree with TEAMWORK, only certain companies actually put it to use? We know it works, and when put to good use it not only benefits the TEAM involved but generally results in positive outcomes for the end buyer. At Solar Vision Inc. we believe Teamwork is the driving force in any success we have, and we do it without cheesy break room posters. 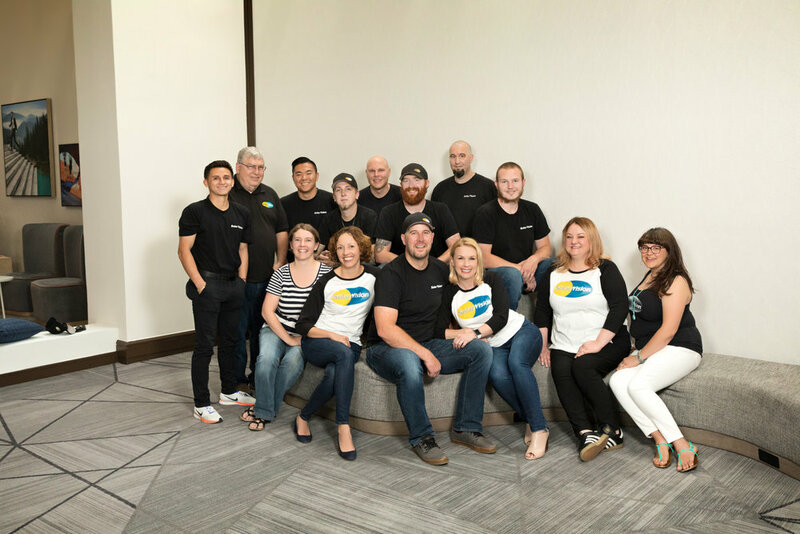 Solar Vision Inc. is made up of 14 people who work together daily to ensure projects are completed, goals are met, and customers are satisfied. We have 2 Owners, 3 Office Personal, 2 Sales Professionals, and 7 Window Film Installers. That's right! We have the same amount of sales and support staff as Professional Window Film Installers. 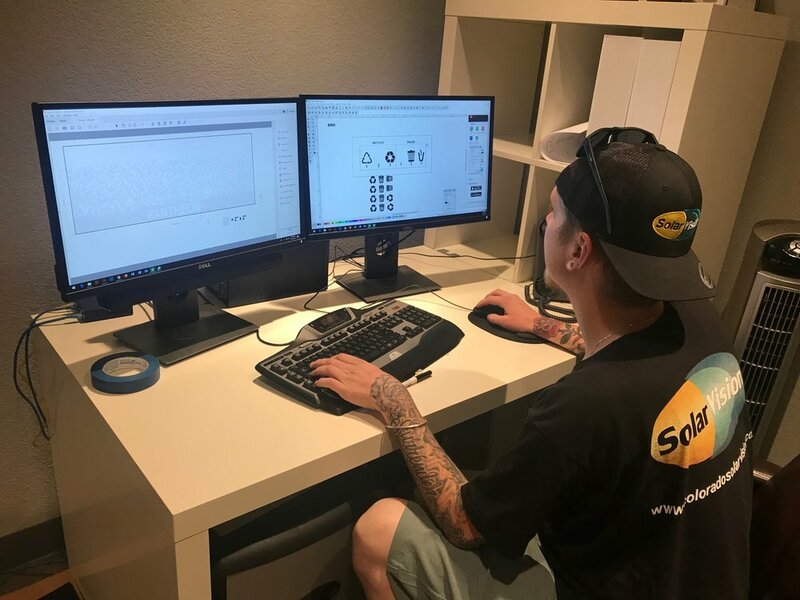 Before our Installation Team arrives at your location, your project will probably have spent most of it's time with our Office Support Personal than anyone else at Solar Vision Inc. However as the end user, you'll be most familiar with your Installer. That's why we find it important to ensure they have all the resources and support they need to complete your project. Solar Vision Inc. Window Film Installers are part of the TEAM! This may not seem to impressive, but in todays landscape, most window film companies sub-contract out their work to other companies or independent contractors, and this can be true for many trades. At Solar Vision Inc. every position is important, and no job is completed without the efforts of our amazing installation crew, combined with our sales, and support staff. When Solar Vision Inc. is hired for a project, our method of operation is collaboration! We do this by conducting morning meetings between our Installation Crews, and Support Staff, by setting goals, and meeting them together, and by genuine trust and respect amongst each other. TEAMWORK. It isn't just a cheesy term, but a method of operational management that sets the difference between stellar organizations, and mediocre ones. Solar Vision Inc. GM Lucinda Costello, and Office Assistant Susie Schurr. You probably haven't seen them, but if you've worked with Solar Vision Inc., you've probably spoken with Susie and Lucinda. Glass is everywhere! It's the best way to change out an existing office space without having to build walls. 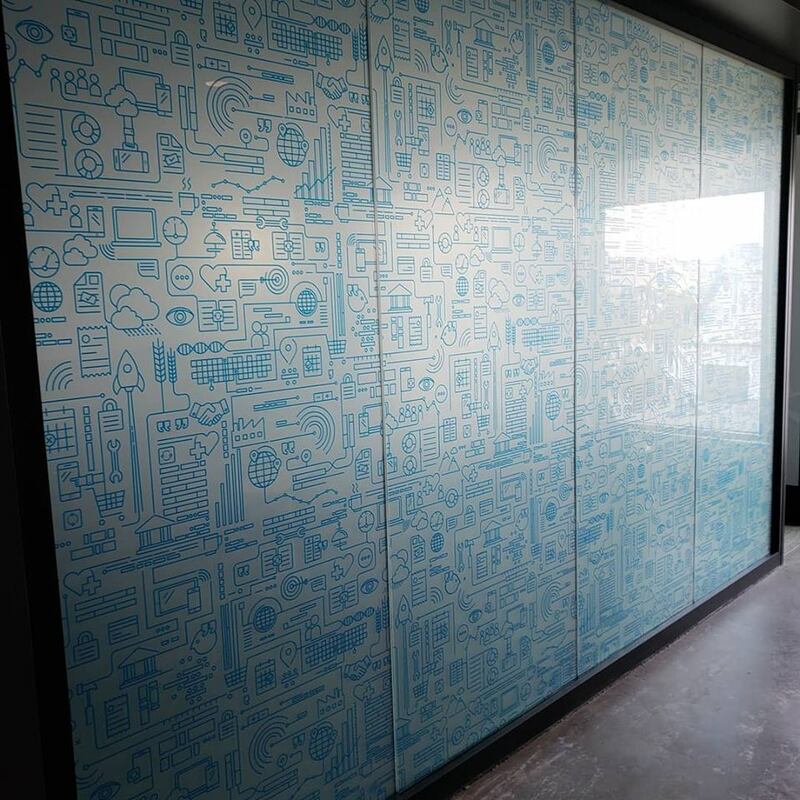 Because we use so much glass in office spaces today we have the ability to customize this blank canvas anyway we want. Even a simple band of frosted window film can turn a dull space into sleek work environment. Simple 36inch band of 3M Fasara Milano. Custom cut 3M Dusted Crystal. 3M Fasara Prism and Dusted Crystal. Most windows films are applied using a solution of soap and water. The adhesives of window film are on the film. To activate the adhesives they need to be completely soaked with water, making water one of the most important aspects of a good window film installation, well that, and a great Installer. Because water is so important, Solar Vision Inc. has decided to partner with Culligan Water to ensure we are only using the best water on the market for our window film installations. Our in-shop water filtration system uses reverse osmosis, and softening to ensure the cleanest install possible. Water can be different all over town depending on the city you live in. Some cities have very hard water which can leave a haze on your glass, and make the install very difficult, by using purified Culligan water straight from our shop, our installs are consistent, no matter what part of Colorado you are from. A good film install starts with a great Installer, the best window film on the market, and Culligan Water. This little co-branded contraption is a pressurized water tank used for installing window film. This glass is ready for pick up! Sometimes it just makes more sense for Glaziers to have their glass dropped off so that we can do the film install in our shop. This allows our Installers to control the elements like dust and dirt, while working more efficiently and quickly, which in turn saves our customers $$$. The film product featured below is 3M's Black Electrocut. This film is a great solution for hiding walls, and building interiors you do not want viewable from outside. Solar Vision Inc. Installer Josh is just finishing up this 3M Black Electrocut Install. 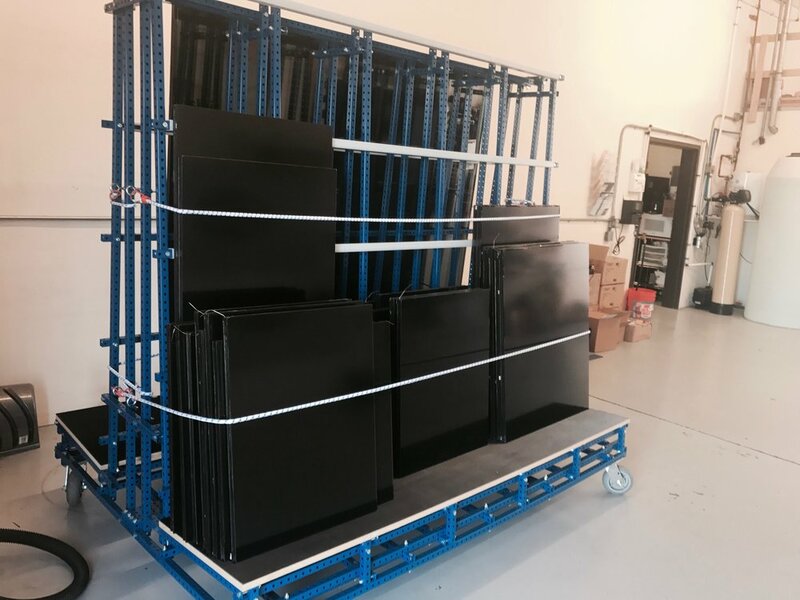 Custom glass racks make it easier, and safer for us to transport the glass to your trucks. Ooh La La...New Fasara Book, and New Fasara Films! Attention Designers and Architects! They're finally here! New 3M Fasara books, with new designs. Call us 303-862-6376 or email us info@coloradosolarvision.com for a copy and start specifying over 30 new Fasara Window Film Products. My personal favorite is the new Fasara Decorative Film Walnut series. They'll go fast, be sure your library is updated with the most current products. 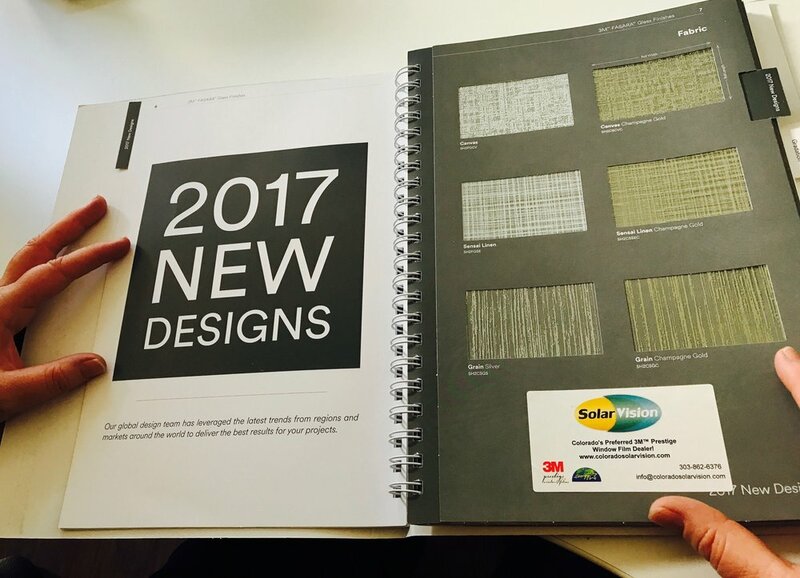 New 2017 Fasara 3M Glass Finishes Sample Book. Over 30 new 3M Glass Finishes Films! 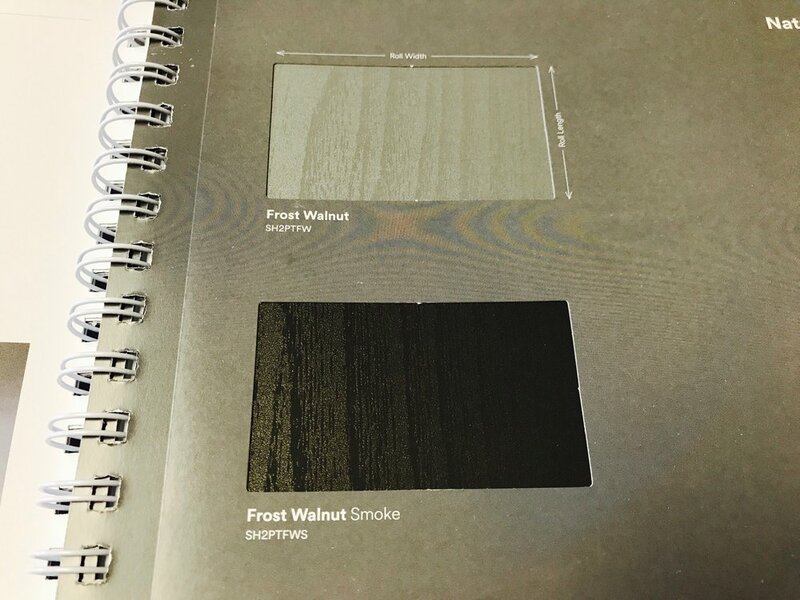 Loving this new Frost Walnut series, especially Smoke. Imagine using a free resource to light your home or building? Well now you can using 3M Daylight Redirecting Film! Clerestory glass and other high up windows can cause a lot of heat and glare, which results in a nuisance below. You can reduce the glare by using a typical solar control film, however, if you want to make the most use of your free natural resource you can use 3M Daylight Redirecting Film instead. 3M Daylight Redirecting Film takes the sunlight and guides it to the center of the room, instead of straight down. Below is an example of 3M Daylight Redirecting Film at work from start to finish. The pictures were taken at a local Denver bank. The lobby has a beautiful tower with large windows to allow in natural light. Unfortunately that light was causing a lot of glare issues in the lobby for the customers and employees below. After completion the light is now where it should be....up above!! This is a great photo to highlight what was happening with the light before 3M Daylight Redirecting Film was applied. This was still early in the day, so you can imagine where the sun glare ended up in the afternoon. In the eyes of everyone below! These high windows required a scissor lift for the application of 3M Daylight Redirecting Film! This photo highlights the soothing frosted appearance of 3M Daylight Redirecting Film. Here's a partial application of 3M Daylight Redirecting Window Film. As you can see the windows on the right are receiving the most sun during this photo, and the light is directed up. Here's an unaltered photo of the completed look. The 3M Daylight Redirecting Film has stopped the glare and downward direction of the sun's rays. Now the light is directed to the center of this tower allowing a beautiful glow to illuminate the lobby area of this bank. Solar Vision Inc. is one of Colorado’s leading window film dealers, and 3M’s #1 Window Film Dealer in the state. We are looking to add a professional, motivated, and resourceful person to our team! The right candidate is a self-starter with good communication, and customer service skills. Along with hourly pay, Solar Vision Inc. offers some of the best benefits in the window film industry including paid time off, holiday pay, 401K, and medical benefits. Assist in the daily operations for Solar Vision Inc. including job scheduling, inventory management, facility organization, and etc. Answer company phone calls, and reply to company emails.  Act as consultant to customers regarding window film products and services.  Order and organize window film, samples, and other supplies from distributer.  Fill out and complete basic warranty and invoice forms.  Collect payment from customers.  Handle customer inquiries and deliver excellent customer service.  Coordinate and ensure cleanliness and organizational proficiency of Solar Vision Inc. office and warehouse facility.  Must need little supervision.  Must be a self-starter.